Although decks and balconies can be a beautiful and relaxing element to any home, they can pose serious dangers for babies, toddlers and preschoolers. After all, children are naturally curious and unaware of danger, a combination that is highly precarious. Young children may easily become trapped between railings or even worse, slip through and fall. So it is important to always consider the safety of your children at every stage of their development, considering that their capabilities for problem solving grow as they get older. The first thing you have to keep in mind when considering child safety on decks and balconies is the actual decoration and layout of the area. Do not place chairs, furniture or any objects near to railings or low walls, as children can very easily discover how to use them as climbing structures in order to peep over the edge or toss things over. In any case, a young child should never be left unattended in a deck or balcony area, even with safety measures in place. Remember to check that all doorways and stairs are also child proofed for safety and that all electrical outlets are also covered with plates or covers. When safety proofing the area be sure to use safety netting or balcony guards that come with the highest quality standards. You also need to make sure that they cover the spacing requirements and fit the area in use adequately, in order to truly provide a secure environment for your child. Be sure to measure the distance between balcony railings carefully, as it should measure a maximum of 4″, both between indoor and outdoor deck and balcony railings and between bottom rails and deck floors. These materials can be a good option for childproofing a balcony. They are durable transparent materials that offer a great deal of safety but are also attractive to the eye. They are more expensive than other materials you can use and not generally available over the counter. Neither are they easy products to install either, so once you have special ordered the material, you may need a carpenter to help you cut it to size and install it. In comparison to Plexiglas, this material is a lot less expensive and can be bought and installed easily. It generally comes in a roll, can be easily cut to size using scissors and is fairly lightweight and easy to maneuver. Deck netting is durable and made from plastic. 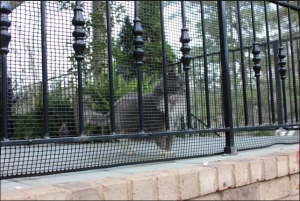 It is a mesh style netting that is specifically designed for outdoor use and is not difficult to install. You can cut it quite easily with scissors and secure it directly to the deck floor. It is usually secured using screws or plastic cord ties or staples, although staples are not recommendable as they can become loose and pose a choking hazard. Shade cloth is a material which is usually used for hanging over a greenhouse to cool it or to provide a shady screen. They are aesthetically pleasing, come in a variety of colors, materials and types of weaves. As they can offer shade from between 5 and 95%, they are a good option for discouraging children from climbing on balcony rails and can provide some light shade without ruining the view at the same time. Shade cloth is available commercially and can be installed very easily and at little expense. 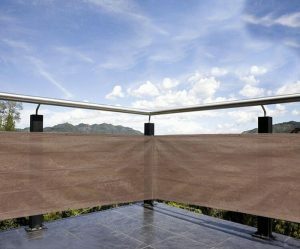 Another alternative to covering your balcony railings or deck flooring with an entire type of material, is simply to modify it in order to make it safe. Just by adding extra vertical slats or spindles, you can fill in railing gaps and make it child proof. This option is more appealing if the railings are made of wood, as a metal stricture is more difficult and expensive to modify. It is important to remember to childproof windows and doors that lead to balconies or decks, as these can be primary ways for your child to reach those areas. Adding latches or locks to them is the best way to make them child proof. They should be installed high up enough to be out of your child’s reach. And try to look for latches or locks that your child will not be able to figure out how to manipulate, as he grows older. There are several kinds of door alarms available for childproofing doors to balconies and decks. Some buzz or make a loud sound when a door is opened, letting you know that your child is trying to sneak out. Most are very easy to install as they come with double backed sticky tape for attachment and run on regular batteries. These child proof gates are designed to stop little ones from even getting to the deck or balcony area without your supervision. Designed for sliding glass doors, they allow you to keep your child inside, while still being able to have the actual sliding door open. The gates are easy to install without the use of tools, by simply clamping onto the actual frame of the sliding door and wedging it open. However you decide to childproof balcony and deck areas, make sure that the installment follows the manufacturers guidelines and that proper maintenance and safety checks are done to any equipment or materials in place. And don’t forget that child proofing these areas is only one step. It is also important to explain the dangers of these areas consistently to your child, in order for them to understand the implications of playing there themselves.